Seriously!! Every time it rains, Tustin Unified saves money. Here’s how it works. Walk into the garden and look to the left; you’ll see a very large black tank, known as a rain cistern. Pipes run from it to newly installed rain gutters. It’s amazing how much 1″ of rain adds up when multiplied by hundreds of square feet of roof space. When it rains, water from the roof goes into the gutters. The gutters channel the water to the pipes that feed into the rain cistern. At the bottom of the cistern there is a faucet where a hose can be attached. You probably guessed it by now; we are collecting rainwater for irrigating the garden in our very own cistern; thereby reducing the amount of water used at TMA. In mid September we had a bizarre 15-minute rain storm that deposited 250 gallons in our rain cistern; that’s 500 containers of milk. Water collecting, known as water harvesting, makes for great science or math problems. What’s the correlation between the amount of rain fall and how much we collect in the tank? Is it consistent year round? How long does it take for us to deplete the tank? How much water do we need to collect and in what intervals to be self reliant? When it rains, water tends to travel a path of least resistance, which may end up being a problem. This was the case in the garden where roof water runoff began to carve out mini grand canyons in the garden walkways. Now that we’re harvesting water and channeling the overflow in a different direction, we’re able to better manage the damage to the walkways. We can never control nature, but try to manage it to the best of abilities in a small way. So, LET IT RAIN, LET IT RAIN, LET IT RAIN! Come see our new irrigation system and feel free to ask questions. 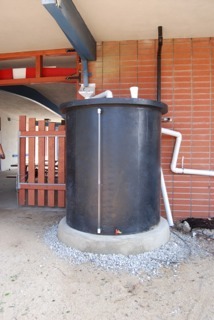 Oh, by the way, the cistern was donated by Ronco Plastic. The project was designed and installed free of charge by ecology consultant, Mark Hay of Coast Live Oak School, and TMA parent, John O’Brien. No money was taken from our core educational needs. The garden is self funding and actually creates positive cash flow to the school thanks to the donation of materials from our sponsors and for all the hard work of our parents.